Britain's Prime Minister Theresa May walks out 10 Downing street in London on Wednesday. She announced that if her Brexit deal is approved by Parliament, she will step down from her post. Members of May's own Conservative party had urged her to promise to step aside in exchange for their votes for her deal. She announced her willingness to step down at a meeting of Conservative lawmakers. "I am prepared to leave this job earlier than I intended in order to do what is right for our country and our party," May told the Tories, according to a meeting transcript released by her office. She did not set a specific date for her departure. The resignation would clear the way for a different Conservative leader to steer through the next phases of the U.K.'s divorce from the European Union. May has survived two no-confidence votes in Parliament, most recently in January. 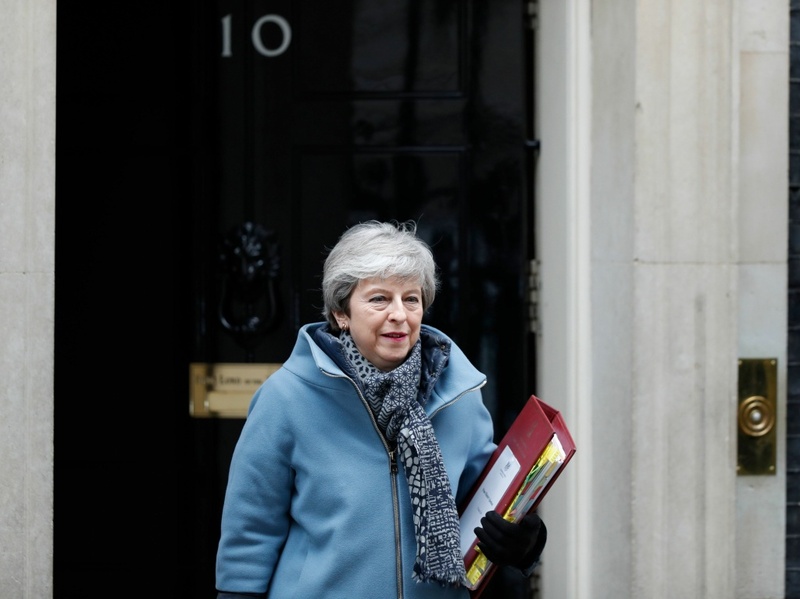 The government hopes the prime minister's offer will encourage more lawmakers to vote in favor of May's deal when it is presented again. The plan is for that to happen on Friday, but it is not clear if the speaker of Parliament will allow it to be brought forward for a third time. There are early signs that May's vow is winning over some of the renegades in her party, though whether she can garner enough votes to pass her deal remains to be seen. Charlie Elphicke, a Tory member of Parliament who voted against May's deal in the most recent vote, tweeted that he would now support it. "I am now gravely concerned that we are now at risk losing Brexit. In the light of today's events I will be voting to support the deal so we leave the EU & make the most of the opportunities of Brexit." Labour party leader Jeremy Corbyn blasted May's announcement. "Theresa May's pledge to Tory MPs to stand down if they vote for her deal shows once and for all that her chaotic Brexit negotiations have been about party management, not principles or the public interest," he tweeted. "A change of government can't be a Tory stitch-up, the people must decide." The country has been in political chaos since June 2016, when it passed a referendum to leave the EU. Britain's Parliament has been unable to approve any plan for leaving the bloc, and has been stymied by details such as how to manage the border between the independent Republic of Ireland and Northern Ireland, which is part of the U.K., once Britain leaves the European customs union. Last week, EU officials granted May a short extension to come up with a Brexit plan. If May can get Parliament to accept the terms she has worked out with the bloc, Britain has until May 22 to leave. But if Parliament does not approve her deal, the country has only until April 12 to figure out what to do – significantly increasing the odds of a "no-deal" Brexit, which many believe would be disastrous for the U.K.
Nicola Sturgeon, the Scottish first minister, said May's vow is a sign of just how poorly the whole process is going. "If Brexit ends up being forced through on the basis of a deal no one supports - indeed a deal so bad that the PM has to promise to resign to get it through - it will make an already bad project even worse," she tweeted.